As I first get my hands on Lawbreakers, the new competitive FPS from Cliffy B-headed studio Boss Key Productions, I’m reminded of quite a few things. Firstly and most affectingly, I’m reminded of Quake 3 Arena, and the under-rated multiplayer of Id Software’s most recent Doom. The familiar exhilaration is immediate and unmistakable. The match starts, I push forward, and I fly, my will converted into action and swift, fluid motion with extreme deftness and efficiency. My presence in Lawbreakers’ dayglo world of carnage is cemented without a flutter. Lawbreakers’ control is a blend of urgency and comprehensibility both giddy and instantly instinctive. Next, I’m reminded of Titanfall 2, as I rapidly discover my character’s special traversal abilities. Within no time at all they combine with all of the above to see me effortlessly hurling myself around the arena, wall-running, double-jumping, nailing precision, mid-air takedowns, and using low, flowing knee-slides in between to build momentum for the next launch. Those glorious, edge-of-control goosebumps kick in, but Lawbreakers is so well tuned that I stay comfortably on the right side of the line throughout. Then a few moments later – because a few moments is all it ever takes for something big to happen in Lawbreakers – I’m reminded of Destiny’s Crucible, and more specifically its high-energy Capture the Flag variant, Rift, typified as it is by explosive, kinetic breakout plays and heroic clutch-saves. The set-up here is similar. A scoring MacGuffin spawns in the middle of the arena, and my team has to steal it and deliver it home, attacking and defending at the same time in order to secure safe passage and the explosion of as many enemy players as possible along the way. Only here, all of those multi-layered, strategic delights are amped up to the next level. I learn my chosen class’ purpose with rare immediacy. I’m playing a Wraith, the swift and versatile team runner, who combines quick, burst-fire DPS with a throwable, explosive dagger for on-the-fly trap setting, and a time-dilation burst for slowing down and taking out would-be pursuers. Lawbreakers does a great job of delivering transparency in all of its characters’ skills and purposes, its simple, standardised button set-ups for melee, alt-fire, and abilities working in neat conjunction with excellent visual and ‘physical’ feedback. Alongside its clear cooldown timers, the clean comprehensibility of Lawbreakers’ cause and effect is – in both UI and gameplay – another welcome reminder of Bungie’s game. Here, just as there, clarity leads to understanding; understanding leads to action; and action leads to blistering fun and many a dynamic, air-punching success. A minute into the game, and I’m already mastering powers that I didn’t even know existed just 60 seconds previous. I’m chaining, combining, augmenting and remixing my out-of-the-box abilities like a practiced old-hand. I’m slide-boosting out of my spawn point, launching myself along corridors (floor optional), and then spring-boarding out into the open, double-jumping into the outdoor low-gravity area in the centre of the map. From there, without a drop in momentum or altitude, I’m swimming through the sky, using the force of my dagger melee to pull myself through the air like some kind of ground-defying, lateral rock climber. Hurtling toward my first goal, I see that only one enemy player has managed to match my pace. Dropping him with a few bursts from my machine gun, I pull myself forward again and throw myself down into the pick-up room through a hole in the roof. MacGuffin secured, I just need to get home. Another quick bound outside, a cheeky wall-run around to the next entrance to the main building, and I can slip inside, drop into another slide, and rocket to the objective. As I score, I whirl around and throw a dagger-bomb into the side of the corridor behind me to further ruin the day of the two would-be goalkeepers fruitlessly chasing me. I trigger it, draw them deeper in during the explosive confusion, and then finish them off with a few more bursts. And then I slide-boost away to do it all again. At this point, it isn’t just shooters that I’m reminded of. In a more abstract way, Lawbreakers has the feel of a good fighting game. It’s the immediacy that does it. The immediacy, the malleable, open-ended comboability of its character powers, and the constantly surprising, emergent altercations. Not to mention the sense of anyone-can-win fairness in all the showdowns I run into. 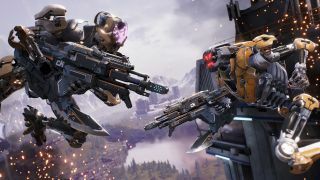 Whether I’m dealing with a medium-range duel, a rapid, lateral dance for control of an important room, or a huge, omnidirectional, Matrix-style mid-air battle in the skies of the low-G area, every shape of conflict that Lawbreakers throws my way feels wide open. The win is promised only to the player who can do the smartest and / or most unexpected thing first. Looking for more AI assailants (and real-life opponents) to shoot merrily in the face while you mull LawBreakers over? Here's our run-down of the best of the modern FPS crop. And there’s vast scope to do such things. Everything I experience in this play-through comes solely from the Wraith class, and - as much swift mastery as I manage to cram into my play-time - I walk away feeling that I probably still have a lot more to learn. Even better, Lawbreakers currently has nine announced classes, and playing each one looks to deliver a whole new game-within-a-game in itself. There’s the Combat Medic, who can spread massive splash damage over contested areas with their grenade launcher, and also throw healing drones out to troubled team-mates, or knock incoming enemies back with a healing bubble-shield. With a jetpack also allowing aerial management of the fight from far above, that’s a heck of an interesting and well thought-out set of skills. Then there’s the nimble, hit-and-run Assassin, whose swift, decisive use of grappling hooks lets them drop into position from nowhere, for all manner of close-range blade kills and shotgun executions. And there’s the Harrier, a long-range support class who can match the sustained laser pain of her energy rifle with the propulsion beams that burn from her flight-boots, able to launch backward into the sky to escape while raining down death from her heels. Once up there, she can survey the situation, and throw down ammo and energy resupply cases to any ally who might need them. Or, getting back down to ground level, the Enforcer can combine an assault rifle and electric shotgun with EMP grenades and a distortion field (which speeds up his fire-rate and reload) for strong zone control, before chasing away interlopers with tracking rockets. Or… Look, you get the idea. Lawbreakers might remind me of a great many things (and yes, Overwatch is included) but it also feels entirely new and distinct, entirely of itself, and ready to express its personality in as many different ways as it can muster. And as complex as all of that might sound, based on my experience so far, I can’t see Lawbreakers being held back on the accessibility front. This feels like a game designed to take you from novice to capability as fast as its characters can run and fly between control points. Playing it didn’t just remind me of Quake, Doom, Destiny and Titanfall. It reminded me of playing those games at my peak, when I was well-practiced, honed of skills, and confidently discovering exciting new ways to play and win on a near-nightly basis. It’s rare to feel like that about any new competitive game, even less so a fast, confrontational, aerial-focused shooter with a big spread of asymmetric classes. But feel that way I do. 25 minutes in, and – thanks to Lawbreakers’ multitude of subtly smart, quietly friendly design decisions - I’m enjoying levels of confidence and competence that make it feel more like a few weeks. For all of the many impressive things on show in Lawbreakers, the thing that really stays with me is just how much fun it seems to want me to have, and how quickly. I’m more than happy to take it back up on that offer as soon as possible.